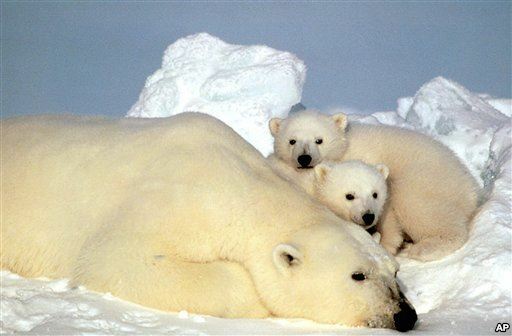 A polar bear and her cubs rest on an ice pack in the Arctic Ocean. From VOA Learning English this is As It Is. Welcome back! I'm Caty Weaver. The United Nations and the World Meteorological Organization created the Intergovernmental Panel on Climate Change in 1988. The panel is a committee made up of hundreds of scientists. Last week, an IPCC working group released a report about climatic conditions around the world. Today, we will tell you what it says. And later we visit India where shrinking glaciers and melting Himalayan snow could affect millions of people below. Scientists are surer than ever before that the Earth is warming and that human activity is to blame. That is the message of the new report from the Intergovernmental Panel on Climate Change. As we hear from Christopher Cruise, the report's findings will help inform policy makers and the public as they consider action to fight climate change. "It is extremely likely that human influence has been the dominant cause of observed warming since the mid-20th century." The head of the World Meteorological Organization, Michael Jarraud, spoke at a press conference about the new report. "It should serve as yet another wake-up call that our activities today will have a profound impact on society, not only for us, but for many generations to come." Greenland and Antarctic ice sheets have been losing mass and glaciers continue to shrink, the report says. It calls the decrease of Artic sea ice, "unprecedented," meaning nothing like this has been noted before. The report also examines the mean rate of sea level rise. It says that since the middle of the 19th century, the rate is higher than at any time in the past 2000 years. The working group also examined the connection between extreme weather events and climate. Brenda Ekwurzel is a climate scientist with the Union of Concerned Scientists, a non-profit group. She has worked with the scientists who prepared the IPCC report. "The most we can say is that extreme events dealing with coastal flooding and extreme heat, (we have) very, very high confidence with these events being highly linked to climate change." She says the report blames human activity for half of the increased warming over the past fifty or so years. One such activity is the burning of fossil fuels in factories, buildings and cars. This produces heat-trapping gasses. Past IPCC reports have led the way to international agreements like the 1997 Kyoto Protocol. It ended in 2012. The United Nation's top climate official, Christiana Figueres, says the new report will help move new climate talks forward. The Intergovernmental Panel on Climate Change is sometimes criticized as appearing to be too conservative in its predictions. But, Ms. Figueres says this report is right on the mark. "Everything that we thought we knew about climate change has been underestimated, that we will have much faster and much more intense effects from the growing concentration of greenhouse gases in the atmosphere. So, it's a very sobering message that calls for a more invigorated and more accelerated policy response to address that." Government leaders and climate experts will get a chance to do that at the climate negotiations next month. The talks will take place in the Polish capital, Warsaw. You are listening to As It Is from VOA Learning English. Now we go to the northern Indian state Himachal Pradesh to look at the effects of rising temperatures right now. The town of Manali is in the Kullu Valley. It is economically dependent on the thousands of people who travel up the Himalaya Mountains every year to escape the heat of the Indian plains. D.S. Aditya is manager of Sterling Resorts in Manali. He says many people like to visit a snow-covered pass that lies about 50 kilometers up one mountain. "Wherever you go like there's one destination, this is famous. If you visited Manali, Rohtang is main attraction. Because of the snow." The Rohtang Pass has many more visitors now than it did 10 years ago, thanks partly to the growing financial success of India's middle class. In summer months, more than two thousand vehicles crowd the narrow mountain road. Ravi Thakur of Himalayan Caravan Adventure has lived in Manali since he was a child. "Twenty years ago, we could count how many cars are here in Manali. Now, if you come in season time, we do have traffic jam for four, five, six kilometers on the Rohtang Road." Visitors enjoy the beauty of the pass. But environmentalists are warning about the increasing traffic on mountains and glaciers. J.C. Kuniyal is a scientist at the GB Pant Institute of Himalayan Environment and Development. He is studying temperature changes in the Rohtang area. He says temperatures in the Kullu Valley have risen be about six-tenths of a degree Celsius. That is about the same as the average increase worldwide. But, what worries him is the effects of uncontrolled tourism on the mountain ecosystem. "I have seen that the regions which are facing a high influx due to floating population or human activity, there aerosols are increasing. These are supposed to be the main causes to melt the Himalayan glaciers." The aerosol gases come both from diesel-powered vehicles and burning of wood for cooking by local people. The smoke leaves thick black ash on the glaciers. This causes them to absorb, or take in, more heat. Local people are witnessing the effects of climate change and human activity on glaciers. Ravi Thakur has been walking the mountains since childhood. He says he has seen a loss of mountain snow and glacial ice. "We keep going every year, almost to the same routes, and I have seen that glaciers, they are receding. In 15 years I have seen that big change." That has raised concerns. The area's local glaciers are the headwaters for rivers like the Indus and the Ganges. The two rivers are the source of fresh water for millions of people in South Asia. Pradipto Ghosh is a director at the Energy and Resources Institute in New Delhi. "If the present trend of gradual loss of net glacial mass continues, then over time the flow from the glaciers would reduce." Scientists say there is serious concern about water for agriculture on the Indian plains. Arun Shrestha is a climate change specialist at the International Center for Integrated Mountain Development in Nepal. "Those communities, their agricultural system relies quite heavily on melt water." Some people, like mountain guide Ravi Thakur, worry about possible changes in the future. "Till I leave my life, we won't be facing those scarcity of water, but later on, the coming generation, they will have problems." Environmentalists will continue trying to establish how deep those problems might become. And that's As It Is for today. I'm Caty Weaver. Thanks for joining us!